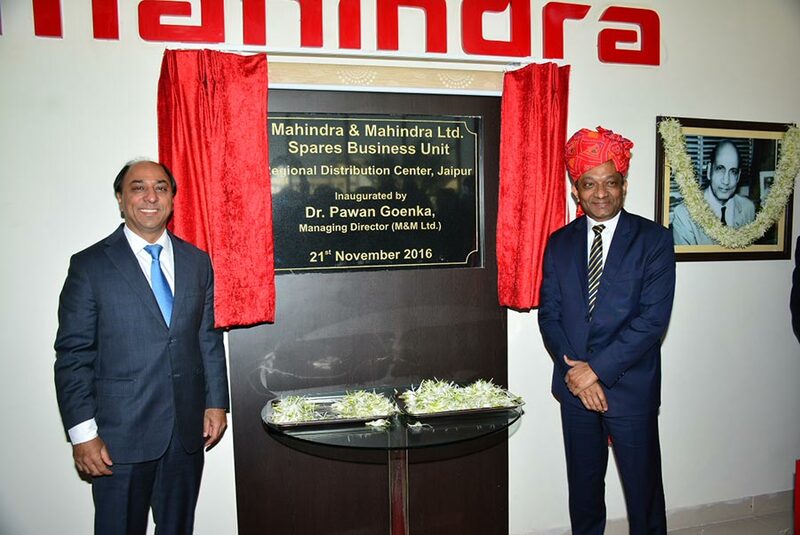 Mahindra & Mahindra Ltd (M&M Ltd), part of the US $ 17.8 billion Mahindra Group today announced the inauguration of its state of the art spare parts warehouse in Mahindra World City (MWC), Jaipur. As one of the largest, most modern warehouses in the country and the company’s first in northern India, it will cater to the requirement of Mahindra customers in north and north western region of the country for both automotive and tractor spare parts. The warehouse was inaugurated by Dr. Pawan Goenka, Managing Director, Mahindra & Mahindra Ltd., in the presence of other senior company officials. Spread over an 11 acre plot with an additional 5 acres for future expansion, this state-of-the-art spare parts warehouse aims to significantly reduce the order processing time for its customers based in North India. The processing time for the availability of spare parts and distance-to-market is expected to take less than 4 days. The company will procure spare parts from over 1,000 vendors and 9 plants for this new facility. With an investment of Rs. 150 crores, it will generate employment for over 450 direct and indirect employees. This Regional Distribution Centre (RDC) is one of the first such facilities to implement SAP – EWM for lean processes ensuring simpler, faster, more accurate and efficient warehousing. This is expected to be a major enabler in easing processes, enabling higher speeds through automation and reach world class benchmarks in process, scalability, flexibility, speed, infrastructure and quality. According to Hemant Sikka, Chief Purchase Officer, Automotive & Farm Equipment Sectors, Mahindra & Mahindra Ltd. It is a moment of pride for us as we inaugurate this state of the art warehousing facility at MWC, Jaipur and in the process set new standards for warehouses in India. With a significant investment and employment generation, we are highly invested in the state of Rajasthan. I am sure this will also provide an impetus to the industrial growth of the region. At Mahindra we are committed towards creating awareness and ensuring availability of original spares among our customers and to that extent, the company is reasonably insulated from the threat of counterfeit spares. The warehouse in MWC Jaipur is part of our expansion strategy and going forward we will create a network of spare parts warehouses in West Bengal, Kanhe and the southern states. This is the Mahindra’s 4th spare parts warehousing facility, with the others being in Kanhe for Automotive Parts, Bhiwandi for Tractor parts & Hyderabad for Commercial Vehicle Parts, which send out supplies directly to dealerships and in the open market. The world class warehouse in MWC, Jaipur has state-of-the-art infrastructure including a 4 storied warehouse for stock storage, a store capacity for Rs 130 crore of inventory and extreme flexibility in the storage system. The warehouse incorporates a flexible and agile approach which will ensure that it is able to respond rapidly to evolving customer needs and ensure easy access to original Mahindra spares. With its commitment to sustainable spaces, Mahindra has ensured energy efficient lighting that saves 15% compared to normal lighting power consumption, while the design allows maximum sunlight and 100% use of metal pallets as against wood. As an economic nerve centre of livelihood and living, MWC, Jaipur provides the perfect space and environment for such a large scale world class warehousing facility. The warehouse has effectively utilized the facilities provided by Mahindra World City (MWC) in terms of water, space, electricity, approach roads and land with a clear title. MWC Jaipur is a business destination of choice for leading Indian and transnational companies for its world-class industrial infrastructure, strategic location, connectivity to Northern and Western markets, a well-developed business ecosystem and ample availability of ready and technically skilled manpower. It is an ideal location for the warehouse to address the fast growing Indian market especially for faster go-to-market.